German: In Max Mustermann begegnet man dem fast klassisch zu nennenden Vertriebsmann, der ausgeprägte Macherqualitäten besitzt und unabhängig denkt und handelt. Unternehmer ist er weniger im Sinne eines ganzheitlich denkenden und sorgfältig analysierenden Managers, sondern eher in Hinblick auf seine zupackende und dynamische Art, die Dinge anzugehen und umzusetzen, ohne jemals das Ziel und das gewünschte Ergebnis aus den Augen zu verlieren. 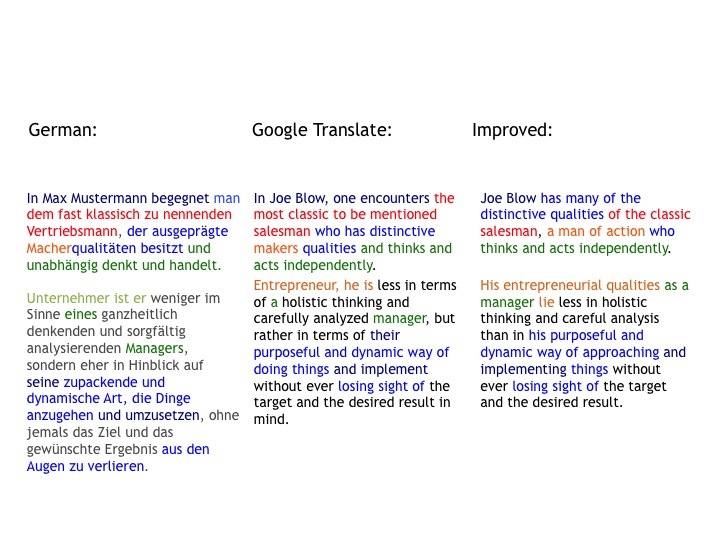 Google Translate: In Joe Blow, one encounters the most classic to be mentioned salesman who has distinctive makers qualities and thinks and acts independently. Entrepreneur, he is less in terms of a holistic thinking and carefully analyzed manager, but rather in terms of their purposeful and dynamic way of doing things and implement without ever losing sight of the target and the desired result in mind. Improved: Joe Blow has many of the distinctive qualities of the classic salesman, a man of action who thinks and acts independently. His entrepreneurial qualities as a manager lie less in holistic thinking and careful analysis than in his purposeful and dynamic way of approaching and implementing things without ever losing sight of the target and the desired result.